Waterfall Serio review | What Hi-Fi? Despite looking rather like a PC-partnering desktop system, it's clear that Waterfall wants us to think of the Serio 2.1 as a discreet hi-fi system. The idea is that using something called Heatstream technology, the company has enabled its dinky speakers (roughly the height and width of a CD case) to handle the kind of power usually associated with much bigger speakers. Of course, there's a separate subwoofer to help fill-out the sound, too. In theory it sounds great, but in practice it falls short. Play the Gladiator soundtrack and the delivery is disappointingly dull and flat, lacking the dynamic drama that we know is on the disc. Detail levels all-round are reasonable, but unspectacular, and treble seems cut-off and short of sparkle, further reducing the attack and openness of the delivery. There's a bit of a lack of bass depth, too, but this is one flaw we can just about put up with, as its a trade-off for the Serio's one key quality – integration. As we well know, getting a subwoofer to integrate with satellite speakers is a real challenge, but here the HF1 sub tonally and rhythmically melds harmoniously with the tiny speakers. Is that enough to make up for the system's other sonic shortcomings? No, and when you factor in that neither the satellites or subwoofer look or feel as luxurious as the price tag suggests, you can perhaps understand why we're so disappointed by the Waterfall. 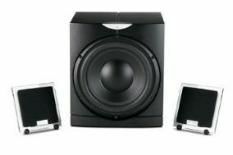 For this money you can pick up a complete, 5.1 B&W MT-25 package, and it still sounds better in 2.1 than the Serio. Damning, but true.